Scheduling is my life. Scheduled calendar. Scheduled posts. Scheduled tweets. Anything that I can line up in advance and make my life easier. Unfortunately, last month I had an uplanned break from my Bloglovin' promo scheduled tweets, thinking I wouldn't see much difference. Yep, I was wrong. So, so wrong. WHY SCHEDULE TWEETS? Some people hate scheduled tweets. In fact, some people hate them so much that they will unfollow those who they deem to promote too much. That's never bothered me since the benefits far surpass the risk of a couple of people getting bored of me. 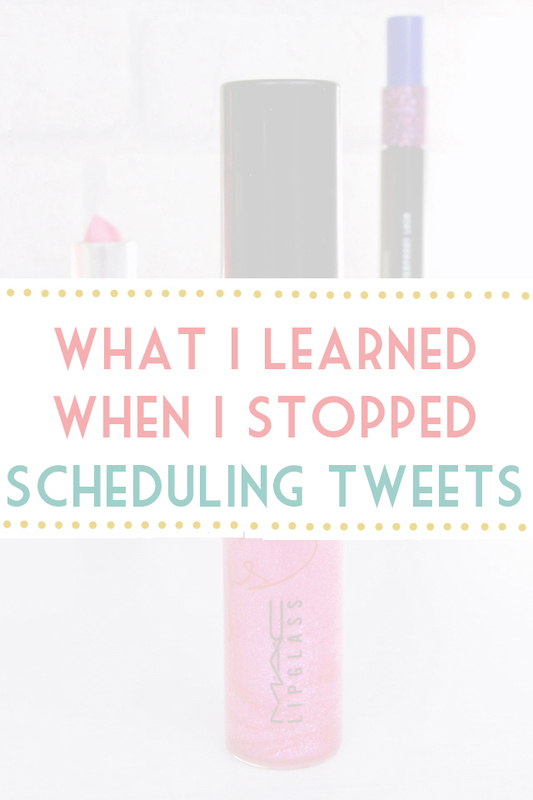 I schedule my Bloglovin' link every other hour, even though Bloglovin' isn't my priority when it comes to growth. The reason I choose this link is because I kill three birds with one stone (is that a phrase?) as it helps in a triad of areas- my Bloglovin' followers, my traffic and even my Twitter followers. Bloglovin' Lately, I've been looking for more blogs to follow. Bloglovin' makes it so difficult to find blogs that don't have approximately 5 million followers, so instead I search "#lbloggers Bloglovin" on Twitter. This brings up a huge number of people promoting their Bloglovin' links so I can easily check them out and follow. Then, of course, there's the times I see a promo tweet on my timeline and check it out from there. People may not go out and hunt for your Bloglovin' link but if you put it in front of them, they're more likely to check it out. Traffic This hardly needs explaining, really. The more people who visit your Bloglovin' profile, the more people visiting your blog. Simple. Twitter I don't know about you, but when I'm looking for new people to follow on Twitter, I just search a hashtag- say #lbloggers- and follow anyone interesting who is using it. I might not click the link that they're tweeting, but I'll check out their profile and follow them. Sounds like a wonderful idea all round, right? The only downside? It takes forever and I hate it. Since I'm an epic procrastinator, I prefer to schedule as many tweets as I can in one session so I don't need to keep doing it every few days. For this reason, on the first day of the month, I schedule my tweets for the entire month ahead. That's one tweet every other hour for 31 days. 372 tweets*. Yep, it takes a good couple of hours. It's a boring, repetitive, mind-numbing task which I wouldn't do unless it was really, really worth the effort. *I use Hootsuite which, while far from perfect, allows unlimited (I think- I've yet to reach the limit) tweets for free. I tried out some different trials of other programmes but didn't find one I got on with as well as Hootsuite. Last month, when I was running around in a frantic panic with a thousand things to do before going on holiday, I simply ran out of time. As you may have picked up by now, I despise scheduling tweets so I thought I'd experiment. Maybe it was really a fruitless task. Maybe the benefits weren't actually that great. Maybe- just maybe- I could get away with never scheduling tweets again. Boy, was I wrong! I immediately noticed a marked decline in the rate of growth. I told myself it was because I was on holiday but, when I got home, things didn't go back to normal as I expected. By the end of April, my stats for the month were pretty dire. Yeah, yeah, it's not about the numbers yada yada. Bloglovin' Taking an average of the increase in followers each month for the previous three, I reached 38% of that number. THIRTY EIGHT PER CENT. Admittedly, Bloglovin' isn't massively important as a statistic but you've got to admit that's still pretty shocking. Traffic My traffic wasn't quite as bad, at 87% of my average, but it's still a considerable drop. Twitter The increase in my Twitter followers was 79% of my average. Since the vast majority of my traffic comes from Twitter (second only to those people who Google "forward helix piercing"), it's important for me to keep my Twitter growth up. The overarching lesson I learned? Pull your finger out and schedule the damn tweets. Yes, it's annoying. Yes, it takes forever. But, boy, is it worth it! Sorry if you hate scheduled tweets. You might want to unfollow me. Really interesting to read this, I find scheduling tweets so, so tedious but this post has left me in no doubt that it's worthwhile! I use Buffer for one tweet a day - usually for my social media links and archive posts - and Tweetdeck to schedule promotional tweets for new posts. You've made me think now though that I should stop worrying about annoying everyone and schedule more! I really need to do this! But I wouldn't even know where to start? What do you even write?! I love scheduled tweets! Although scheduling them is the dullest thing in the WORLD. They definitely make a huge difference to my traffic and following, though - I only tweet my Bloglovin link once a day, maybe I need to try doing it a few more times! :) Really interesting post, it's nice to see your concrete stats from not scheduling. Yeah, I hate scheduling tweets because it is so time-consuming. I notice a difference when I do it, but I'm just so bad at procrastinating when it comes to scheduling that I rarely remember to do it. I need to pull my finger out! Interesting to see just how much it did affect you! I love to schedule a few tweets a day to promote my blog and on that day, if I have time, I will post a couple of "live" tweets to change things a bit and give my twitter more personality. I notice that when I schedule tweets my page views and even amount of new followers per day changes big time! im glad to see and read this. I always wonder if scheduling my tweets actually does anything. Maybe I should check it out too! Im going to try hootsuite for sure. Id love to know more about it. This is such an interesting post, Becky! I know that not scheduling makes a huge difference to me as a small blogger, so I'm very interested that you (as a much larger blogger) found the same thing. Also excellent insight into the benefits of sharing your bloglovin link, you've inspired me to share mine more often! I don't schedule tweets but I know I really should...this posts confirms it! I wouldn't unfollow someone for doing it either, unless they were scheduling promo tweets every five minutes! Then it might get a bit annoying! Great post Becky, I've been scheduling since the start of this year & notice a massive difference if I ever stop. Every time I forget to schedule tweets I end up really regretting it, it takes time but it's worth it! Super interesting to see that you get most of your traffic from Twitter. I've seen almost all bloggers put their main focus on Pinterest & gain most of their traffic from Pinterest. I am big on Twitter & not as much on Pinterest, so I'm glad to see there is hope for getting traffic on Twitter. I also love Pinterest, I just feel that it isn't as effective as Twitter.